In 1944, toward the end of his life, D. W. Griffith lamented, “What’s missing from the movies nowadays is the beauty of the moving wind in the trees.” By then, the sound film had eclipsed the cinema the director had shaped in the early decades of the twentieth century. For Griffith, movies had become talkative and quick, their rapid montage obscuring the fleeting details in the background, not only the rustling of tree leaves but also the small, barely noticeable touches that give a film the full sense of a world—or, in the case of Terrence Malick’s latest, The Tree of Life, a universe. 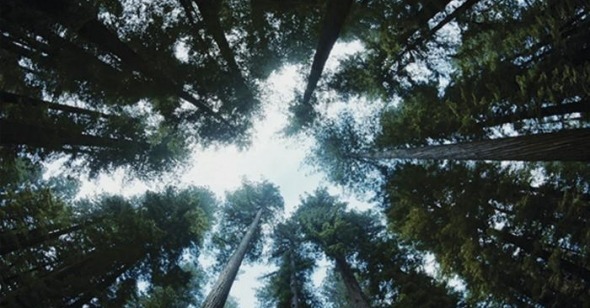 I imagine Griffith would have been pleased with the many sky-bound tree views in Malick’s films—aside from magnolia blossoms in Tree, there’s Kit and Holly’s treehouse in Badlands, burning bushes in Days of Heaven, swaying palms in The Thin Red Line, and virgin forests in The New World—but moreover he likely would have been awestruck by the formal breakthroughs that accompany them in Tree’s elliptical arrangement of time, its visions almost entirely composed of the incidental. Even without the film’s already controversial foray into the cosmos, these small moments of one family’s life in a quiet Texas town amount to nothing less than the eternal. Partly scored to three requiems (Tavener, Preisner, and Berlioz), Tree resounds with loss, questioning the meaning and memory of a brother’s death that remains open like a wound. It’s loosely told from the perspective of Jack O’Brien (Sean Penn), though his presence is more felt than actually seen. We accompany him as he stares out from the top of a sleek Houston skyscraper, his thoughts turning to the past, first revisiting the effects of the tragedy that tore his family apart at midcentury, then delving into the origins of the universe itself. In an operatic, lengthy sequence, big bang gives way to clouds of celestial light and galactic expansion. On the earth, geysers burst, dinosaurs crane their necks, and we see time—all time—passing swiftly. The poignancy of loss persists, however, in the voice of Jack’s mother (Jessica Chastain). Her grievous prayer in this section in many ways responds to the film’s opening citation of the Book of Job, a passage in which God chides Job for his lack of understanding and his limited view: “Where were you when I laid the earth’s foundation?” Scanning the heavens, this woman of unerring faith challenges a powerful but silent God who took away her son. “Answer me,” she quietly demands. The astronomical interlude brings to mind another Tree of Life, the one sketched by Charles Darwin in On the Origin of Species. For Darwin, the tree was a map of time, a record of change of how we got from there to here. Yet for all the tree’s sprouting branches, the diagram was also about what didn’t grow, the vestiges and broken lines where life seemed to stop. In Darwin’s evolutionary view, each branch competed with the others for space, for nourishment, for life. This is nature as Jack’s father (Brad Pitt) would have it: a struggle to succeed, protect oneself and one’s family, and stand tall and firm against life’s ravaging winds. Built into Darwin’s tree, however, were missing spaces to mark those that didn’t make it, gaps to indicate life that could have been. The death of R.L., the sweetly grinning towhead who inherits his organist father’s musical ear (he’s often seen clutching a guitar), as well as his abandoned ambitions, stunts the O’Brien family tree. In more ways than one, time freezes the moment the fateful telegram arrives. “I never got a chance to tell him how sorry I was,” Mr. O’Brien regrets. And many years later, when Jack apologizes to his father for misspeaking about his brother, it’s clear that this loss remains a vast gulf between them. For Jack, however, memories move like the film’s many images of water, drawing him into their currents and pooling around events both large and small. We shift to an earlier part of his childhood, from his own birth and the arrival of his two brothers to a perennial summer of open windows and overturned bikes. This section, which forms the bulk of the film, is filled with as many magical, mysterious moments as mundane ones. From the tumble of boys in tall grass to a stolen nightgown drifting down a river, sullen dinner table stares and a living room submerged in water, the things remembered mingle with those that might only have been imagined, all of it felt with profound longing, sadness, and joy. When a yellow butterfly lands suddenly in Mrs. O’Brien’s outstretched hand, we get a sense of the delicate wonder she inspires in her children, a creature who can dance airborne before a sprawling oak (an image that recalls a similar levitation in Tarkovsky’s The Mirror), or lie like a fairytale princess in a glass coffin deep in the forest. Yet the world of Jack’s childhood is far from idyllic. From his father he learns hardness and fear, and after the death of a boy at a pool, he turns to cruelty, shattering windows with rocks and holding his little brother’s finger up to a BB gun. Yet young Jack’s (Hunter McCracken) determined, exacting eyes never lose their softness, even when he sees his parents fighting, or when the family is forced to move out of its home. Paradise may be lost, but it remains near, and through his brother’s tender touch of forgiveness, he gets close enough to feel its lingering warmth. Trees, of course, are abundant, from curtains of hanging kudzu, a spindly evergreen forest, and the tiny dry leaves that litter the streets. When the family plants a gangly sapling in the middle of their yard, Mrs. O’Brien, seen from toddler-height, says to Jack, “You’ll be grown before that tree is tall.” The line recalls Vertigo’s cross-section of a giant sequoia in California’s Muir Woods and the many timelines etched into its grain. Here, time stretches the length of the O’Brien tree, but like the Vertigo redwood it is also imprinted within and beyond its trunk. “Tell us a story from before we can remember,” the boys implore their mother at bedtime. In Tree, we plunge into the deep past and the radical future, desire writing and rewriting what we see, every image an expression of Jack’s endlessly searching soul. In various religious traditions, the Tree of Life represents immortality, eternity, and the connectedness of all life, from root to flower, the human and the divine. In Christian theology, it appears in both Genesis and the Book of Revelations as a figure of the everlasting, and in the Kabbalah it is a symbol of sacred geometry. The Norse myth of the world tree is cited by Stan Brakhage’s Yggdrasill: Whose Roots Are Stars in the Human Mind, an experimental epic that brings together city and country—power lines, fireworks, winter branches, and sunlight skimming the surface of a pond—and, awash in crackled, hand-painted splendor, offers them to the light of the projector. Cinematically, it’s one of Tree of Life’s closest arboreal cousins, a kind of film best described as devotional: one that gives us a direct experience of the world, or as Nathaniel Dorsky writes, “an image that is in itself a manifested act of seeing.” Yet Yggdrasill, too, is riddled with gaps, moments of black, like small breaths, between flashes of color. For human sight is as much about recognizing its own limits, even as it opens widely. Job might not have been there at the dawn of creation, but he might close his eyes to imagine it. And it’s this power of imagination, of sight untrammeled, that gives life to every memory, symbol, and dream. Malick’s Tree of Life is the film itself, and it never ceases to grow, to connect as it brings together, remembers (and re-members) strands long lost and forgotten. In this way, Tree’s greatest gift is to offer the O’Brien family an eternal reunion. Mother, father, and all three brothers: as they walk together across a shallow sea, we hear a quiet susurrus and later, the sound of a steady breath, a vespertine wind to stir every last leaf.